The above-titled survey was done by the Ministry of Health, Northern Province of Sri Lanka with the support of an expert panel under the directions of Hon. Provincial Minister of Health, Dr. P. Sathiyalingam. The three districts of Kilinochchi, Mannar and Mullaitivu were covered. Here is a preliminary report based on their report. This was meant to be a survey of the Northern Province. However, after the Kilinochchi data was released, the government felt uncomfortable and ordered the suppression of the Mullaitivu and Mannar data which Colombo Telegraph has accessed and produces here. The data for Jaffna and Vavuniya is not ready because the study is not complete. We may never see that because the embarrassed government has halted funding of some Rs 11 million that is due. 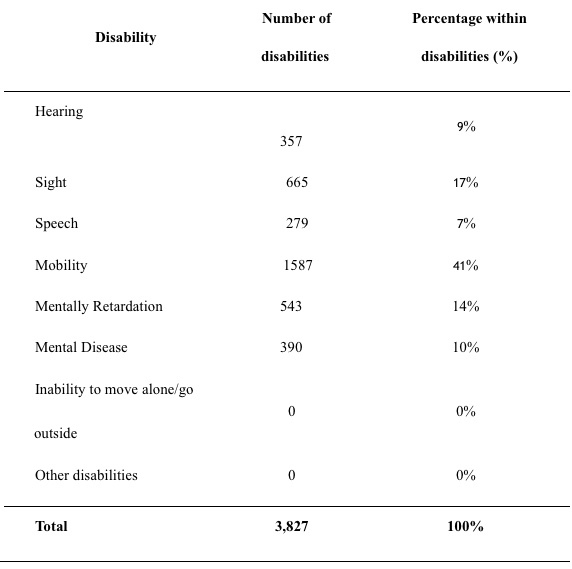 Total number of households surveyed in Kilinochchi, Mannar, and Mullativu = 92,681; Number of disabilities = 20,380. 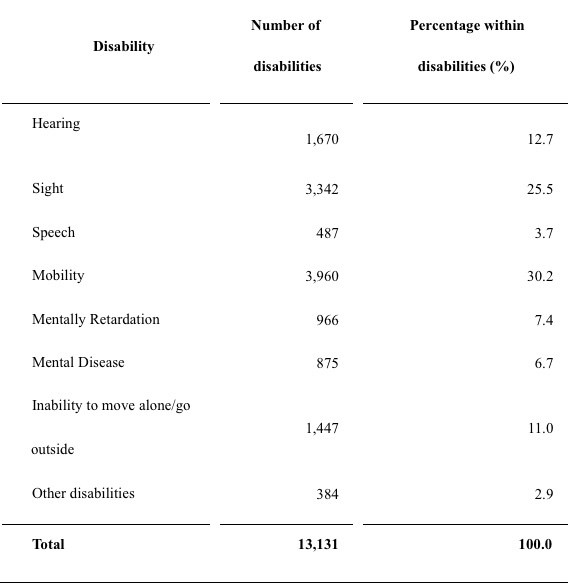 Assuming 5 persons to a household, the disabilities are 4%. Are these disabilities through natural causes or as a result of the thirty year war. How will the government funding be disbursed. Is it through financial assistance to the disabled or through medication. Deserving cases should not be ignored by the government. The number of disabilities can be slightly more than the number disabled as there will be people with multiple disabilities. The affected people belong to the poorer sections of the population and have not attracted the attention of the government as well as influential sections of the society. I agree with your recommendation and no form of political screening should be encouraged in addressing the issues. This is why I have been saying that whatever government that comes to power will be racist. If the government cannot face the truth and correct itself, how do you expect them to be fair to Tamils. Without rehabilitating these people, government is going ahead appropriating lands and settling Sinhalese to alter demographic pattern. There is no point in building bridges across rivers if you cannot build bridges across hearts. Ignoring the plight of Tamils has been all along and is unlikely to change in the future. True indeed! An unacceptable situation that needs effective measures to care for the disabled.The plight of the poorer Tamils have been created by diaspora Tamils with racist mindsets who have using them as suicide bombers, foot soldiers and cannon fodder. Many in the NP live in poverty; with disabilities and mental illnesses. The racist, genocidal diaspora Tamils now shed crocodile tears for the poor, dispossessed Tamils they created over the 30-year conflict. With ill gotten billions of dollars accumulated through extortion, drug smuggling, prostitution, people smuggling, racketeering stashed away for their own use, they do nothing for the poor Tamils in the NP. Very sad, indeed! The racist war mongers received a humiliating defeat in May 2009. Is it a wonder that the poor of NP are thankful for the SL military for protecting them from the diaspora vultures! A sea change in the demographic pattern is needed and, is in place now in the NP to bring about a caring atmosphere to the province. 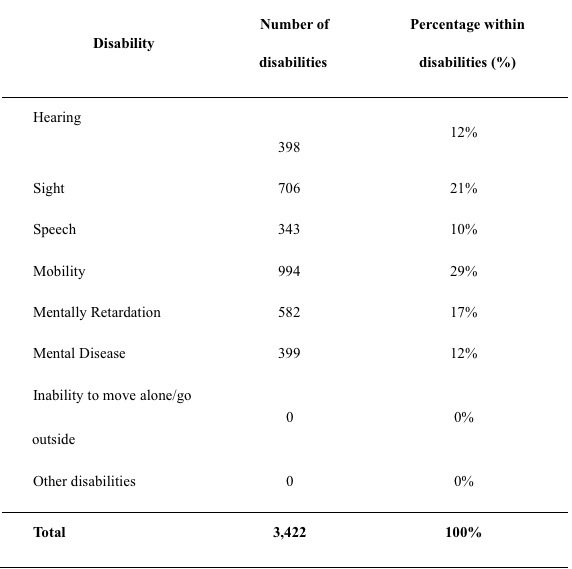 You have done a very good job by publishing the facts of the disabled. As usual as they are mostly Tamils, government will not accept responsibility to assist them. They will not hesitate to say that the figures are unacceptable. Hence lik all the other matters linked to the Tamils it will be swept under the ‘mats’ not carpets. In my humble opinion, the results of this survey is extremely valuable and I see no reason why the “Government” (looks like the article is referring to the Central Government and not the provincial Government) should be embarrassed. Whether it is the Central or Provincial Government, somebody must step in and help these people. If the strategy employed is right, all these people can be made differently able and thus contribute to the economy of the society in a big way. It is a “National Crime” to allow these people to rot and stagnate. Anyone (like for example accountants, store keepers, CEOs and the like) who tries to hide truth will tell us this may give some breathing space but that eventually it will emerge. In the case of successive GoSL, this living on borrowed time has become a way of life. Besides this is a good distraction from other problems. This withholding funds to scuttle investigations is a new eco-model of whitevans. PS: PCoI into SriLankan Airlines note that funding may get the chop chop! In the South there were two wars only for JVP and LTTE maimed so many soldiers and civilians . Many youth died because of these wars and there are parents with mental disabilites. IT doe snot matter as they are all sinhala people. Even the previous JVP leader had mentally deranged relatives. the article is about the north not about the south. what is wrong with you Tamils? As if you speak for the South and the North. In the old days there was a “Charitable Allowance” of Rs 50/= monthly for destitute persons. Later, this became a “disability allowance” for persons disabled by physical illness – Rs 100 for the person (certified by a government doctor), and Rs 50 for the spouse and children below the age of 18 – monthly. A similar scheme could be revived nation wide. This happens now in socially advanced countries. Socially advanced countries have onlhy one nation and that goes with the majorty. . In Sri lanka, Tamils say we Tamil nation is the superior and give us everything we ask because we screwed up not only you but we our selves. United kingdom has four nations. They have separate teams in football and cricket. Tamils were a sovereign nation before Portuguese conquest, which was not returned to them when British left. It is this lost sovereignty that Tamils are demanding back. Not just the North, it is the entire Island. Mentally disabled, the whole Wildlife Sanctuary crowd! IQ 79. That why the World’s richest Philanthropist feed them with Briani and buy them drinks and provide them toilet facilities on the Colombo streets. I am really got shocked with this news. I am the person initiated this survey and with great difficulty started doing it. I got down funding to purchase tabs and to install the software for the data collection from well wishes and managed to provide it to every midwife in our province. Phase 2 will be done by doctors to get more information about each and every disabilities. In north province the estimated number of people with disabilities are around 42,000. Purpose of doing this survey is not to accuse anyone, but to prepare a medical rehabilitation plan for the people suffering with disabilities. During my 4 years period as minister for health in the NP we worked hard to start this project and finally the work in progress. When I resigned from my portfolio in August 2018 Phase 1 data of Kilinochi District was available and others were on progress. During my time as minister myself or the ministry officials had never been asked not to publish the available data by anyone. After publishing the news in your media many people in social media translating as they want. My humble request to the author of this article to contact the ministry of health NP and to publish the truth. This is another of the recent CT reports from NP with lower quality than before. The author is unknown. It is unclear where the information is from and where the claim that the government has suppressed parts of the reports originates. I do not find this kind of journalism correct. The reports that actually are only summaries are supposed to take up especially women but the totals provided do not show any attempt to divide the numbers for women, men and children. 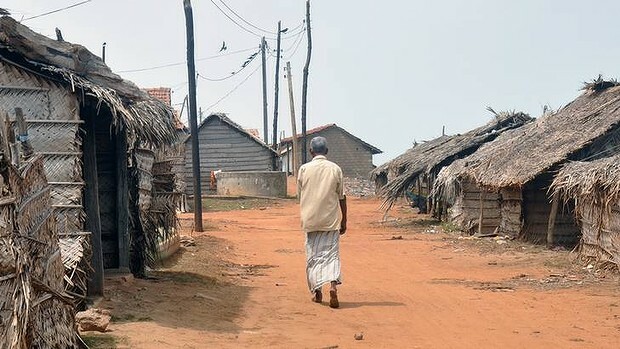 According to these reports Mannar and Mullaitivu have about twice as many mentally challenged as Kili but the sad fact is that the population in Kili is often unable to go out alone while this problem does not exist at all in Mannar and Mullaitivu. How is the reliability? On the home page of NPC Ministry of Health is a long version of a preliminary report for Kili. It clearly shows that behind these reports was Provincial Ministry of Health with some foreign funding . All the consultant doctors appear to be Tamils. All though I dispute the reliability of the existing reports my main question is what is the Provincial Ministry of Health planning to do to help the disabled and especially the disabled women? What has it done? This is not a foreign funded project, it is MoH-NP project. Asia foundation assisted in some occasions. All consultant doctors are doctors I don’t see any difference. Many doctors from all communities took part in this process. MoH-NP is paying disability allowance to bedridden people, constructing disable friendly toilets, a mobile team ( a nurse, health assistant and a councilor) is visiting household with disability and providing basic nursing care ect. Therefore we need more information about those most vulnerable people to plan for a holistic medical rehabilitation services. Thank you for what I consider to be a reply to my comment. I am delighted since you never replied to my attempts to reach you when you were a Minister. I can assure you that our house hold in Jaffna has not been approached by the mid wives armed with tablets. Who should be contacted to receive the benefits you list in your comment? MoH? Mobile medical care is provided in Mullaiteevu, Kilinochchi and part of Jaffna ( 3DS divisions) we are unable to start in Vavuniya and Mannar due to financial issues. But we have a 20 bedded Rehabilitation unit in Vavuniya. At present you can contact for disability allowance and toilet with social services department in your area. Phase 1 is not yet completed in Jaffna and Vavuniya, midwives may come to your household in future. Thank you for the information. What is your role in the project now considering that you stepped down as Ministerof Health more than one year ago? Based on the limited data available on line I do not understand what has been going on with this project. I agree about the importance of it but the rest especially the results and action confuses me. The Preliminary Report for Kili states that the project started in 2015 with 50 tablets financed with funds from Australian Government thru Asia Foundation. How many of the Kili tablets still work? Would not paper and pen have been and be more cost efficient for the rest of the project than tablets? Have more tablets been bought for other districts? How much of the total expenses of the project have been for acquiring tablets considering the total expenses? From the data you have kindly provided I gather that the project has not yet managed to finish Phase 1 in all five districts but despite this it has moved to phase 2 and 3 in some districts and some parts of Jaffna District. 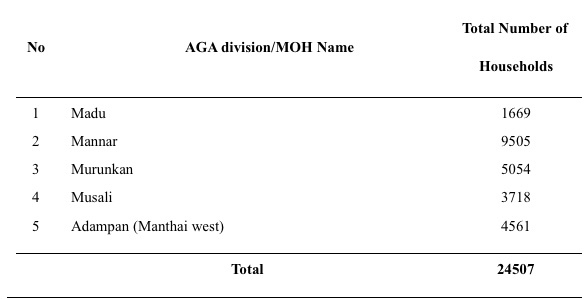 Which Divisions of Jaffna have Mobile Medical Care? Has the field study been finished in these three Divisions? 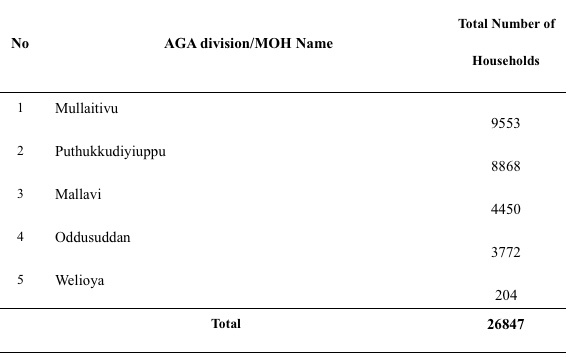 How can some Districts and parts of Jaffna have funds that the rest of NP does not have especially since the data on the disabled is not available in all of NP? Do not or should not NPC government servants working with health and welfare not know about the disabled without any research? The GSs, Samurdhi Officers, Development Officers, for instance, should know who the disabled are but they need a doctor for a medical opinion on the needs of the persons. I believe that most of the disabled are known to doctors already. After this article appeared, I am able to confirm, Governor Reginald Cooray made inquiries as to whether the article is true, and upon receiving conformation that it is indeed true, he issued instructions that the reports for Mannar and Mullaitivu be released and made a special allocation of Rs. 8 million for the completion of the study in Jaffna and Vavuniya. The communication of the allocation has reached the Kachcheri in Jaffna for disbursement and use by the Provincial Director of Health. Thank you for the information you have provided. This project (started in 2016) must be finished, the reliability of the results discussed and action taken to help the disabled. My understanding is that soon Governor Cooray will temporarily be in charge of the province without the politicians. This may be better for the people than what NPC has achieved. The preliminary report for Kili has been on line for a long time.